PLOT: When I first watched this movie I was very excited to see how the plot would spin off from the original television series Eden of the East. Looking back on the first time I saw this movie, it honestly hasn’t left much of a long term impression. I suppose in that vein, it’s a lot like other thriller movies/series in that once the mystery is gone, there isn’t a whole lot left plot wise. Anyways, so The King of Eden picks up where the television series leaves off. After the events of the series, Akira Takizawa wipes clean his memory again, and Saki Morimi makes it her goal to find and help him. A lot of events repeat, such as running into each other in awkward situations, watching a movie together, etc. I wish more could have been done to freshen up the plot a little. It seemed a bit cheesy at times, like it was trying too hard to prove that the two main characters will always be the OTP, no matter if they remember each other or not. While the dynamic duo are wandering around trying to figure out just what it is they should be doing, their friends are trying to solve the riddle of the Selecao, an organization of 12 members whose goal it is to change Japan for the better. Meanwhile these various members are taking sides and trying to eliminate/protect Akira on his mission. The story ends just in time for Akira and Saki to head to Japan. Personally I think the story could have just skipped ahead to Paradise Lost. It really does feel like they could’ve stuck the events of this movie at the beginning of Paradise Lost, or at the very least made it a short prequel to that film. It just doesn’t bring much plot to the picture. PLOT: Like Whitney, I found this movie to be pretty forgettable. We watched it together just a year-and-a-half ago, and I had no memory of what happened so much so that I had to rewatch it to write this review. That should tell you something about how little actually happens in this movie. Whitney’s right that this film is an unnecessary stepping stone between the TV series and the second film. The King of Eden picks up six months after Akira asked to be made the king of Japan. In the aftermath of that wish, he lost his memory and disappeared, so Saki and her friends have been looking for him ever since. 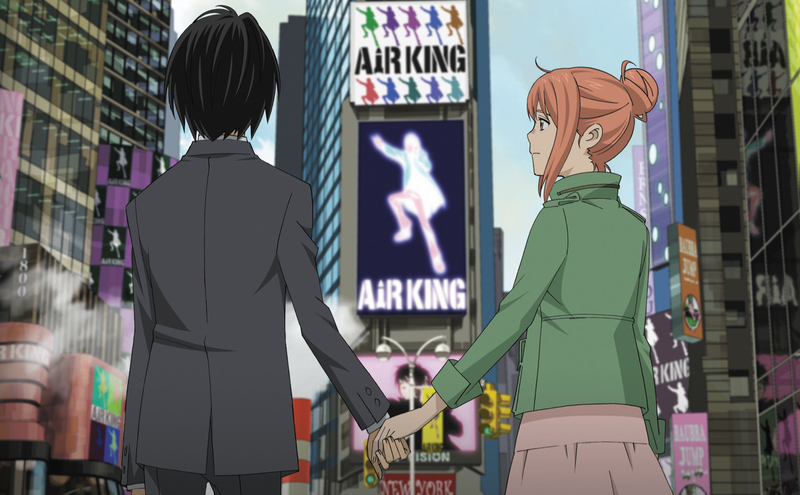 Eventually Saki gets tipped off that he’s in New York, so she goes looking for him to keep him from being caught up in the craziness of his wish to be the king of Japan. While that’s happening, everyone has to deal with the plans of the other Seleção complicating things, since the game resumed with Akira being found. This movie is pretty confusing to watch because there are too many characters with unknown motives. For one thing, Saki and her friends are trying to help Akira in a way that goes against his wishes, which makes no sense. It feels like they’re trying to save him from himself, which goes against what they should know about him as a character and Seleção member. Aside from that, about half of The King of Eden is explaining what the other Seleção are up to without letting viewers see it for themselves. I know the film’s trying to keep the Seleção identities a secret, but that makes for a boring film, with a lot of talking and not much doing. Over the course of this movie, about 90% of it’s talking, with only a little action to move the plot forward. You’re spot on in calling the film out as pure exposition. I’m a visual/kinetic learner, and do badly with hearing information as a means of “learning”. Therefore just about everything that “happened” in this movie was over my head as I kept trailing behind trying to figure out what was going on. This made the movie very disengaging for me. SETTING: The Eden of the East franchise takes place in a modern version of the United States and Japan. Saki’s friends from the television series have formed a group called Eden of the East, who serve as a means to obtain information throughout the series and report news from Japan. They’re in charge of doing all of the hacking and grunt work, and support from the side lines. They are constantly shown discussing among one another before or after a phone call with Saki, where she then uses that knowledge to aid Akira. The majority of the real action takes place in New York. After the events of the television series, Akira disappeared off to New York, and Saki goes there to find him. We are treated to some vague sight seeing and some awesome background shots. As the two travel around, the rest of the Selecao group try to booby trap them along the way, which treats us viewers to some wonderful setting induced action shots. SETTING: Most of The King of Eden takes place in New York City or in the new headquarters of Eden of the East back in Japan. Though I haven’t been to New York, it feels realistic enough to me, without any of that naïveté you find in a lot of anime that idealize America. Instead, the cabbies are rude and the citizens freak out when a gun appears in Saki’s luggage, which is a nice change of pace. New York also looks realistic to me, which suggests that the animators were able to go location scouting in person. I love when anime can afford that, since it makes everything feel so much more realistic. The new headquarters for Eden of the East have a very standard office building feel, and I’m sad we never saw the characters anywhere else. The computer technology they use strains the mind a bit, but this series has enough ridiculous technology between Juiz and the Seleção system that I just roll with it. I would’ve liked more information about how the technology used actually works, but I think that’d be pushing this series to the limit of explainability. You get to the real heart of the issue. More questions are brought up in this movie, with little return on answers. This movie cancels out a lot of what we knew to be fact, or rehashes it in a new location, while denying us new information. Really the setting is more of a distraction than it is an aid to plot development. CHARACTERS: I’m torn on the characters. The King of Eden does give us more screen time with everyone from the television series, but it isn’t quite enough to really do anyone justice. Any development of Akira or Saki, or between them is flushed down the toilet when Akira wipes his memories. This movie just isn’t long enough to redevelop all of of that in a meaningful way. We do get to see more of the Eden of the East gang, Saki’s inexplicable group of NEET friends. However they seem to be thrown in like a trophy wife. Every time we get a shot of them they’re always talking about the life of a NEET and playing up their “NEET” aspects like it’s a novelty. Setting that all aside, it was nice to explore the world of Eden more and to get a better idea of the set up of the Selecao and what everyone’s objectives are and what becomes of everyone. I think the best part of this movie is how it gets you excited about seeing the next one. I agree that every scene with the Eden of the East gang is basically fan service. It feels like, “Hey, remember your favorite NEET characters from the TV show? They’re still alive and nerdily kicking!” I would’ve liked some actual development instead of rehashing what we already know about them. CHARACTERS: Like Whitney said, there isn’t much helpful character development in The King of Eden. Saki and Akira have to work on reestablishing their relationship, and the Eden of the East crew mainly shows off their individual NEET quirks. The other Seleção make some appearances, and we get to learn the identity of another one of them, but overall there isn’t much development on that front, either. For a movie with so much talking, I wish we’d learned more about all of its characters. The character I enjoyed the most here is actually Juiz. It’s easy to tell that there’s a different version of her for each Seleção, but I love seeing the differences in how she developed to interact with them. With some Seleção Juiz is angry and curt, but she has several whom she clearly dotes on, including Akira. Juiz practically gushes when she talks to him for the first time in six months, and she has a similarly adoring relationship with Kuroha. Juiz’s interactions with the Seleção provide more character information than most of this movie, and I wish she got more screen time. ART STYLE/ANIMATION: The Eden of the East franchise has very odd character designs. Everyone is very stick like with large rounded heads. It’s almost as if they have cylinders for heads. It takes a bit of getting used to, but I actually find the designs to be quite charming, especially how the NEETs are drawn out. The only real complaint I have is that the characters all seem too different in design from one another and at times don’t seem like they should be in the same show. This movie has an excellent budget that ties the special effects and key frames in together seamlessly. In large part this is due to the flatness of the shading, which allows for the foreground and moving objects to blend in more with the 3-D models which are left with flat shadows. For once a lack of gradation helps out. I loved all of the action shots and marvelous architecture that was showcased through this film. You can tell the studio put a lot of research into this film while they were creating it. ART STYLE/ANIMATION: I have to disagree with Whitney about the animation for this movie. I’m sure Production I.G used 3D models to make the background work easier so they could focus elsewhere, but I found all of the models super distracting. Every car is clearly a 3D model, but at least they move in a way that doesn’t tip that unless you know what to look for. The background characters, though, are also 3D models, and they walk like it with stiff, unnatural movements that threw me out of the movie several times for the stark contrast with the main characters. I can understand using 3D models on background characters to save money, but if it’s going to be obvious, at least make it artsy, like in Penguindrum. Beyond that, The King of Eden feels a lot like the TV series. The art and animation are probably a little better, but I honestly couldn’t tell the difference in the level of detail. The backgrounds look pretty sharp, but the character designs are recycled straight from the show. That allows for some solid continuity with the visual style, but I find it disconcerting to not tell that I’m watching a movie because of the obvious high budget. Maybe that says more about the TV show’s budget than the movie’s budget. OVERALL: The King of Eden is a necessary stepping stone in order to get from the series to the last movie. I wouldn’t say it’s the best movie, or that it stands on its own very well, but it’s enjoyable to watch just to see how the mystery unravels. That said, I don’t really feel that this movie has much of a second watch appeal. In that case rent, don’t buy, this movie. Which is actually pretty easy because you can find a copy just about anywhere. For example, I rewatched it for this review on Netflix. If you’re still new to this franchise, then I’d highly recommend watching all of it to completion. It isn’t too often we get a smart series like this which talks about events that are horribly relevant to what’s going on in the real world. The King of Eden is full of little snippets that nod to current events both in Japan and the United States. That alone makes it worth watching in my book. OVERALL: The King of Eden is just disappointing, even more so as a rewatch when you know that nothing memorable will happen. I had high hopes for this film to follow up on a lot of issues that the end of Eden of the East brought up, but instead it retreads the same ground with only a couple of new snippets of information. It’s worth watching on your way to completing the entirety of the Eden of the East series, but there isn’t much that can be said in support of it otherwise. As a film, it fails to be interesting or exciting. Even watching Saki and Akira be cute together isn’t fun, since we saw that already in the TV series. I hope a fan edit of this gets made to cut out all of the lollygagging and hand wringing Saki goes through while the movie gets to its main point. So, while this movie is important to the series, it’s not something to look forward to needing to watch. It’s more an exercise in stretching a viewer’s patience than anything.